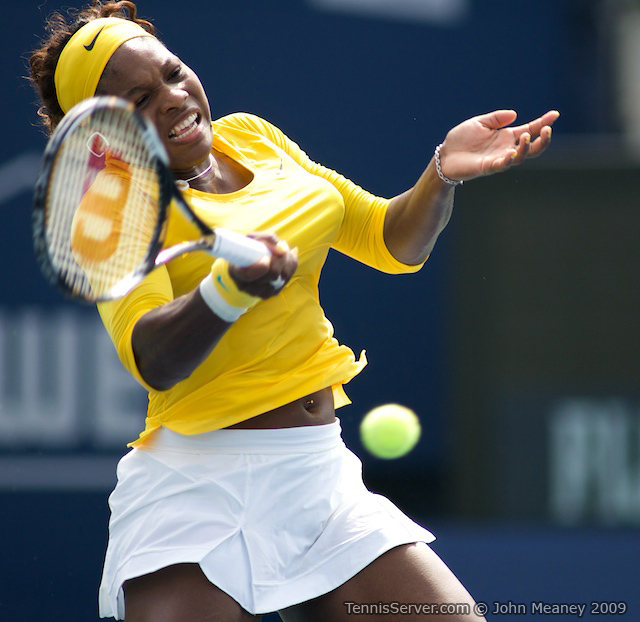 August 20, 2009 -- After the housecleaning yesterday at Rogers Cup, five seeded players remained: Serena Williams #2, Elena Dementieva #4, Jelena Jankovic #5, Vera Zvonareva #7, and Agnieszka Radwanska #13. They dotted the draw in four distinct quarters. They all played today. Elena Dementieva's tenacity and fitness pushed her over the winner's line at Rexall Stadium early in the day, when she defeated a persistent Shahar Peer over two-and-one-half hours of ball blasting, 32 break points with only a third converted, and hot humid conditions that dragged the players down in the end until they appeared to move in slow motion. Final score 61 16 64. These two women had met six times, before today, Dementieva holding a match record of 5-1. Over the last two years, they played three times where Dementieva gave up a total of nine games. 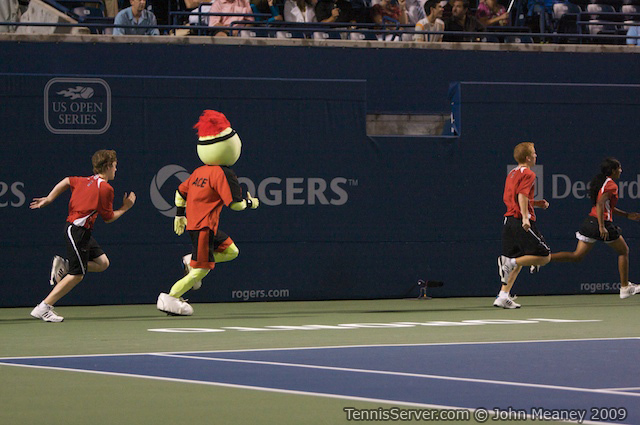 A win by Peer at Rogers Cup would have given the Israeli satisfaction and some revenge for recent drubbings. And she almost did it. "Shahar is such a fighter," Dementieva said. "I play her a couple times, and I know she never gives up. She fight for every point." After a poor showing in the first, Peer stepped up every aspect of her game in the second. She won three out of three break points, 90% of points on second serve returns, and she hit the corner pockets of the court as well as a pool shark in Eight Ball. Her groundstrokes were perfection. At the same time, Dementieva's usually strong ground game -- the thing that has made her so very tough to beat even when her serve stunk -- came apart, with too many balls landing short and a hungry Peer waiting to trounce. "She was not starting very well but, you know, somehow she was able to be more aggressive in the second set," Dementieva said. "I knew it was going to be a tough match." Dementieva went up an impressive 4/1 in the third set, but like so many other women here this week, lost her grasp and the break. Too quickly the scored board read 4 -- 4. Dementieva held off four game points and went up 5/4. 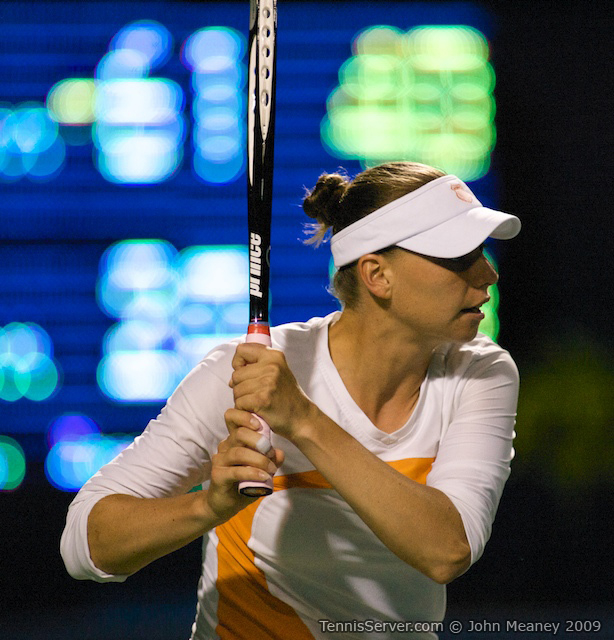 The final game was a back-and-forth ordeal, with Dementieva winning on the fifth match point. 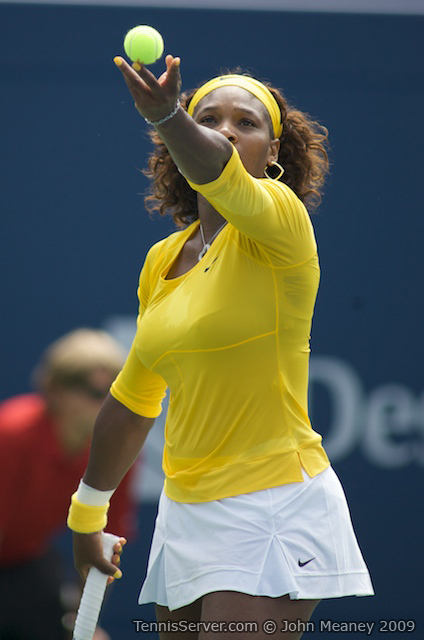 "Ah, well, losing to Jankovic in Cincinnati, four match points, it's not enough for me," she said. "I really need to have like five or more to finish the match." Serena Williams made quick work of Alona Bondarenko, the first Bondarenko sister on court today, in just over an hour 61 64. Williams blew through the first set in twenty-five minutes, but wobbled in the second. 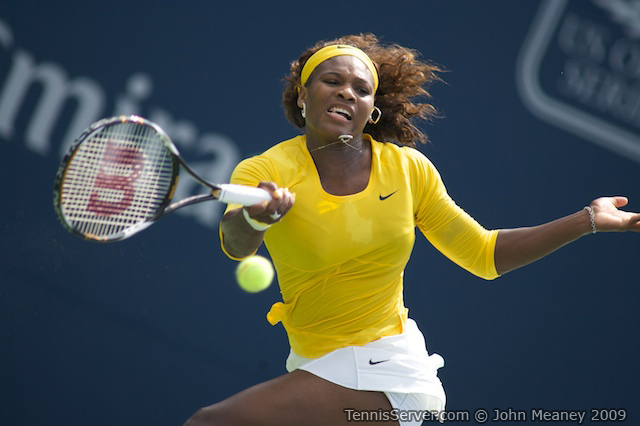 "I just was trying to be perfect, and then I just couldn't get my serve in and got frustrated," Williams said. "I've been practicing a lot on my serve. It just hasn't been well. I mean, I think in any case that can be frustrating." 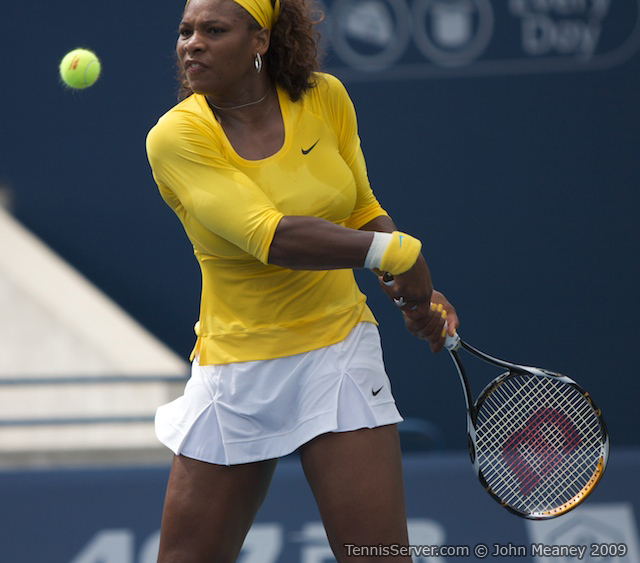 Williams felt her performance today was mediocre, in contrast to what she did yesterday. "I was just a little disappointed in myself today, after playing so well yesterday," she said. "I thought that if I could keep up that form, I'm on my way to glory. Today I didn't play as well, so hopefully I can get it back." "I think grunting is in. Everybody's doing it. Guys are doing it. It's hot. It's what's now, and it's popular and everyone should do it. You know� it's the thing to do." Next up for Williams is qualifier Lucie Safarova who defeated Jie Zheng 76 (3) 64 literally a second before a burst of rain pelted fans. 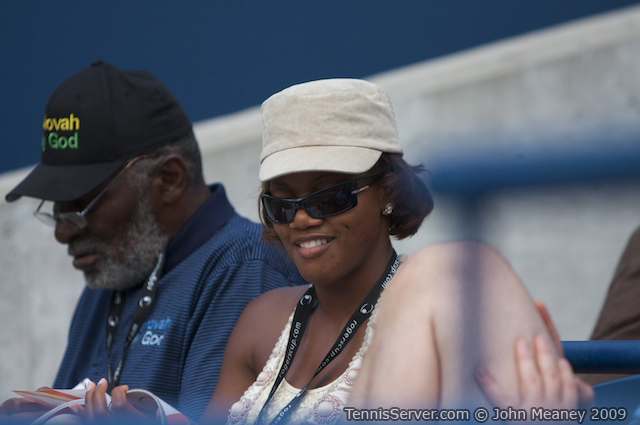 Checking out the match was Richard Williams, Serena's father and coach. He didn't let on what he thought about the players, but Safarova did mention Serena in her press conference. "I've played her a couple times," Safarova said. "It's always been a difficult matches." Both matches have been on hard courts, both in 2007 before Safarova went from injury to injury, first her buttocks then her shoulder. 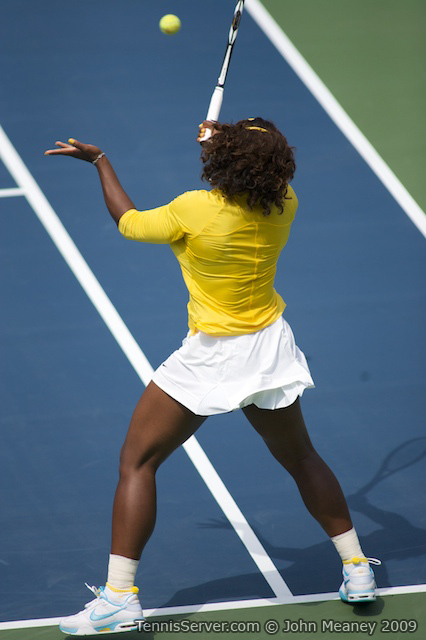 It was during her match against Williams at Hobart (Sydney, Australia) that she injured her buttock. 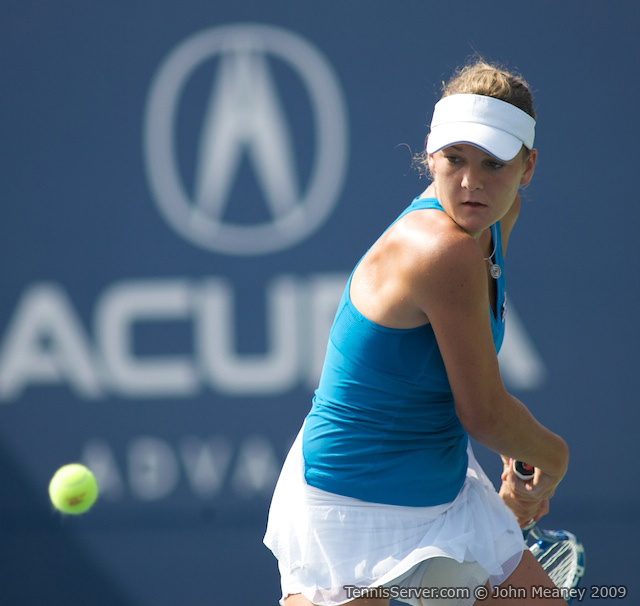 Safarova held two match points when the tear cropped up. The wind on the Grandstand Court swirled and jabbed at Safarova and Zheng. Both caught service tosses. Both were dealt bad points because the wind carried shots long or wide. Safarova chalked up an impressive first serve percentage of 80%, though. "I'm trying to serve aggressive from both sides," Safarova said. "Today the percentage was so high because I wasn't going so much on first serve. I wasn't trying to serve so flat and fast as I do usually. I was more using my rotation that that, yeah." Safarova ousted Ana Ivanovic last night in three sets, after Ivanovic served for the match in the second set. It was one of Safarova's best wins. "I lost to her a couple times before, so I really concentrated this time. It's one of my best wins, of course." Safarova trains steadily now to maintain her fitness and prevent injuries. She is young, only 22 years old. 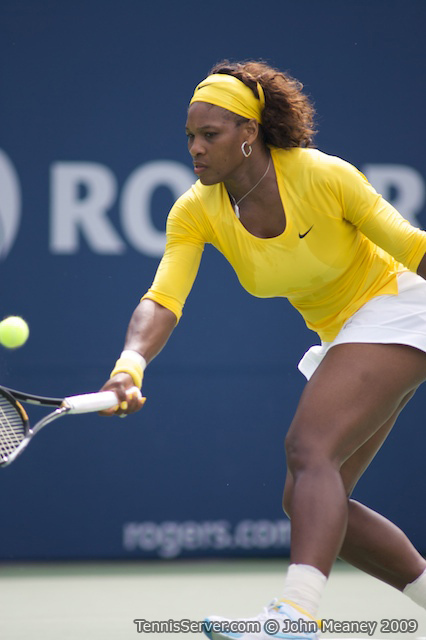 However, she realizes that having done this well at Rogers Cup doesn't portend a clear road ahead. "I'm trying to do everything right, so the exercising programs and stuff like this, so I'm trying to do my best," Safarova said. "I'm feeling pretty good now, so I'm hoping my game will improve and that I can be in between the tops [players]." High winds, tornado warnings, and driving rains closed the Rexall Centre for several hours early this evening. With multiple tornadoes touching down miles north, tournament officials took every precaution to care for fans on site. All restaurants and retailer tents were closed down. People were brought inside the stadium, and escorted to safety in the lowest levels of the stadium. "I don't know much about tornadoes, but I'm a little scared," one woman said. "But I want to look outside and see what's going on, too." Around 8 PM, fans were allowed to leave the safety of the stadium hallways. 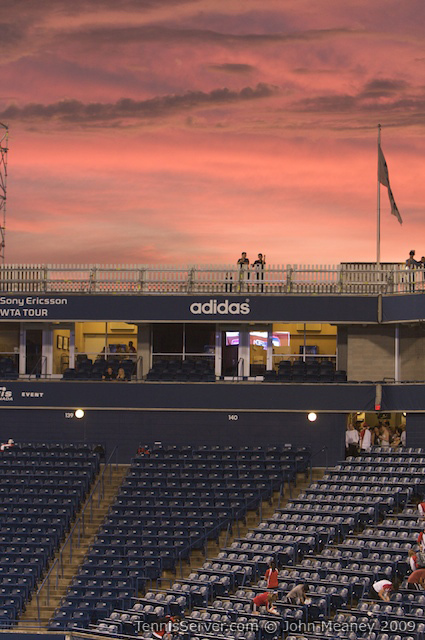 Skies cleared as the storm passed to the northeast; and, tournament staff went to work to dry the courts. It was time for tennis. Rain delays sporadically interrupted Maria Sharapova and Vera Zvonareva, the all-Russian match of the day, but not long enough to take the players to the locker rooms. Sharapova's serve, in the first set, was virtually error free. She committed one double fault, winning the set in less than thirty minutes. In the second, Zvonareva worked points better and slowed Sharapova's onslaught. But, Zvonareva's serve went off and her footwork faltered. Much could be attributed to Zvonareva's right ankle, which was injured at the Family Circle Cup this spring. It kept her out of competition throughout the spring tournaments, plus Roland Garros and Wimbledon. Tonight, with rain and moist conditions she looked tentative. After the first set she had her ankle wrapped, which seemed to help but could do nothing for what went on in her mind. Zvonareva was the first seed of the day to fall 62 76 (3) to unseeded Maria Sharapova -- who only committed five double faults tonight, compared to the seventeen from yesterday.